Allyssa Valquier, a senior at Sidney High School in Sidney, Iowa signed with the College of Saint Mary soccer team today. Coach Jim Homan and Coach Kim Matzen made the short drive to Sidney to witness the signing at Allyssa's high school. Present were her parents, the Sidney HS athletic director, her basketball coach and friends. Allyssa plays soccer with the Glenwood soccer team because Sidney does not have a soccer program. She also plays basketball for Sidney, currently having a fantastic season at 11-5. They made it to the conference finals for the first time in 50 years--quite an accomplishment. Coach Dowling, (Allyssa's basketball coach) said at the signing, "You are getting a good soccer player but an even better person." We are pleased to sign Allyssa. She is looking forward to contributing to our soccer program. She loves soccer and so does her dad who built a full-size soccer field on his property in Iowa. You can see the field just to the east of I-29 if you are traveling south, just past exit 15. Allyssa works at Penn Drug in downtown Sidney. Penn Drug is said to be the oldest pharmacy in Iowa. At the signing--everyone said that Kim and I should check out their old fashioned soda fountain--so we did. Kim ordered the vanilla shake and I had the chocolate malt--both made by Allyssa (assisted by Holly's sarcastic comments--Holly works with Allyssa at Penn Drug.) I must say it was the best chocolate malt ever. If Allyssa's contribution to the CSM soccer program is as fantastic as her malt making skills, we are truly in for a treat! I am pleased to announce the signing of Megan Tuenge, a defender from North Platte High School. 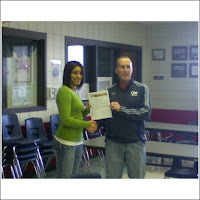 Megan signed her letter of intent yesterday, January 6th in the Alumni room in the North Platte high school office. Attending the signing were Coach Jim Homan from CSM (that's me,) Coach Janie McCarthy (NP coach,) Megan's parents and some of her friends as well as the school activities director. Megan is a very solid defender who reads the game well. She is one of the captains of her high school team. Megan is a very committed player and as a matter of fact, right after her signing, she attended her high school soccer conditioning even after her coach told her she didn't have to come today. Yep, that shows commitment. We are looking forward to having Megan play for us and we know she will make a significant, postitive contribution to the team. Everyone was very excited for at the signing and she was excited too! I was impressed with the North Platte high school building--it is only about 5 years old. One thing interesting about the activities director that I learned is that in the summer, he is a rodeo clown. It is not everyday that you run into a rodeo clown. At least I don't. I also learned that Megan's father is a locomotive engineer--that is an interesting job.